Now available as a front or rear collection nest box! 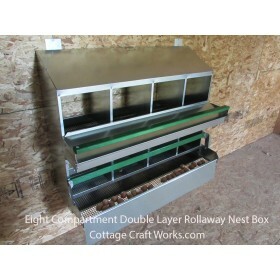 This is our two-compartment roller egg chicken nesting box. A four and eight compartment nesting box is also available. 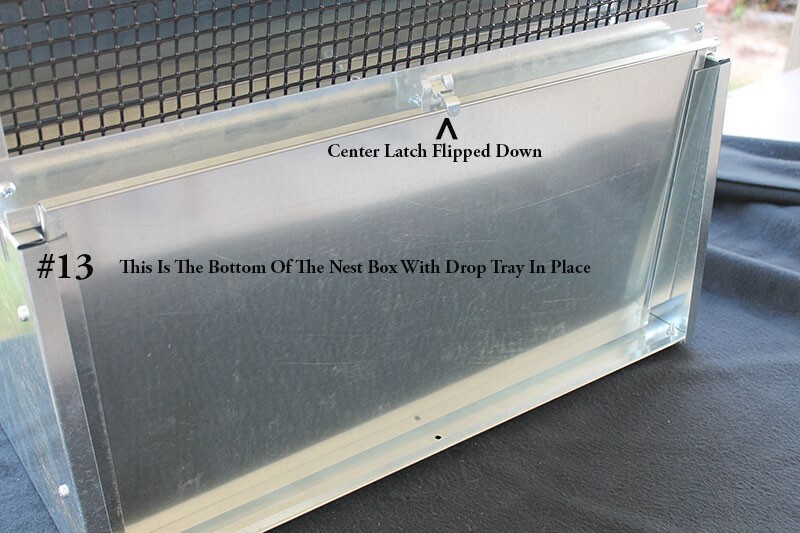 Made from 26 ga and 16 ga high quality galvanized metal these nesting boxes are built using much thicker material than any other nesting boxes on the market. Shipping estimator located at the bottom of this page. Select front or rear collection before using the estimator. 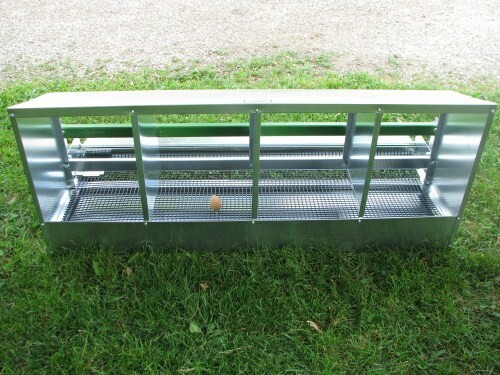 Rollaway egg nesting boxes are specially designed to allow eggs to roll forward into an upfront holding tray to keep them safe from chickens stepping on or pecking at them. When the chicken lays her eggs they roll down PVC coated heavy gauge 1/2” x 1/2” wire mesh floor to the front of the nesting box. 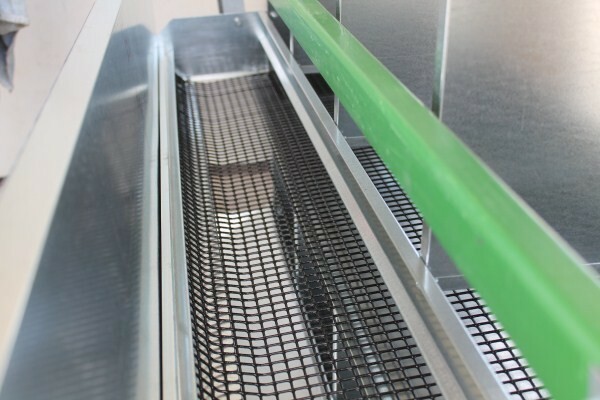 Manure droppings fall on through to a pull-out collection tray eliminating the need for messy laying mats. To collect the eggs simply lift up the front cover and the eggs will be all lined up for a clean simple collection, without having to disturb nesting hens. Manure cleanout is a breeze, especially on the outside rear collection. You can roll a wheelbarrow right up to the box and pull out the manure tray just under the egg collection tray and dump without ever having to reach in or disturb the layers. Nesting boxes come with a training egg. These nesting boxes require no nesting material as it will inhibit the eggs from rolling forward. 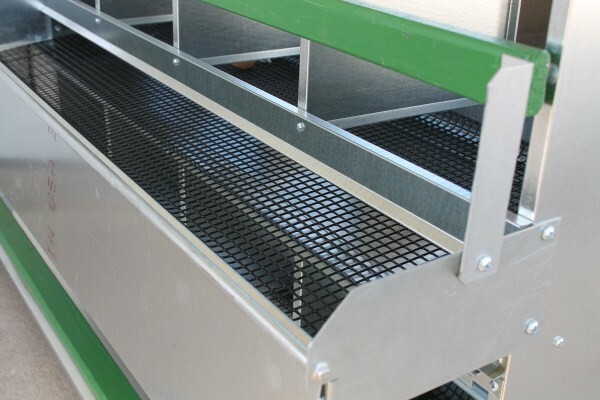 This makes these boxes easy to keep clean and reduces the risk of infestation. If needed, you can use regular amounts of nesting material and then gradually reduce as the chickens become trained. 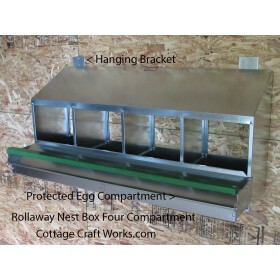 Rollaway egg nesting boxes do not have plastic lids or trays to break as others on the market do, they are also made of heavy 26 and 16 gauge galvanized metal. The 26 gauge is used on the main horizontal structure and the 16 gauge is used for the some of the ends and cross supports. Others on the market use thinner gauge metals. Nesting boxes are simple to install and provide many superior benefits over wooden nesting boxes. To use as a rear collection the nest boxes are hung backward on the outside of a wall over a cutout hole allowing the open back to then become the entry for the curtains to hang on. When the rear collection is selected using the drop-down box we supply a hinged door to cover the once front side and roost brackets to relocate the roost bar to the new front. Selecting rear collection in the drop-down box will incrementally show the price difference for these extra parts. Using them as a rear collection takes up zero space inside the coop and the taller opening created by the slant of the top allows for larger breed birds. Roost bar may be lifted up to discourage entry when needed. 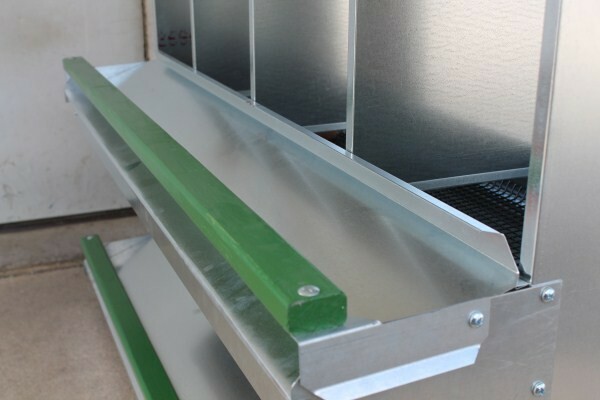 When used as a rear collection the roost bar may be accessed from the outside through the hinged door. 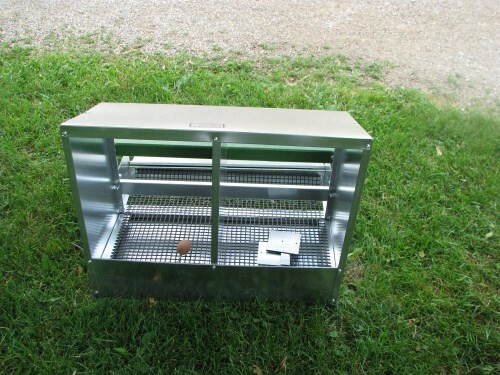 These nest boxes are easy to clean and sanitize, boxes have metal mounting cleats, the cleats screw into a solid wall and the nesting box hangs on to the cleats. Simply lift off the complete nest box to remove and power wash and to disinfect. One nest hole will handle 5-6 hens; four nests will generally provide a family with a generous supply of fresh eggs. Nest holes are 8” tall 11-1/4” wide at the entrance point. Inside compartment measures 14" tall x 12" wide x 11-1/2” deep. When reversed as a rear collection nest box the entry goes to 14" tall which, make is great for larger breeds. 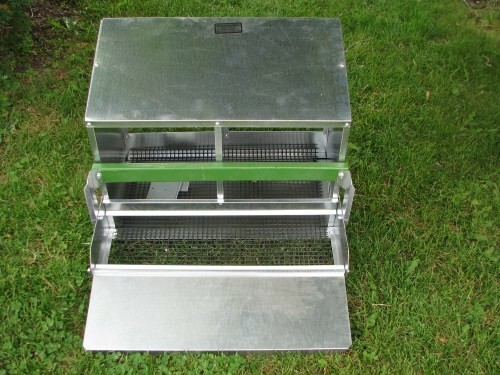 The two compartment nest model measures 24-1/2”wide 20” tall 17” deep. Nesting boxes will be shipped flat and will need complete assembly using 3/16 and 1/4 bolts. 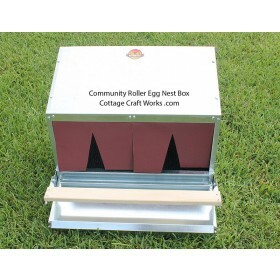 Commercial operations and those interested in an open concept nest box without dividers be sure to check out our commercial grade community nesting boxes. 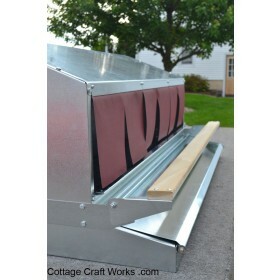 These are also Amish manufactured and designed from the much larger commercial boxes. 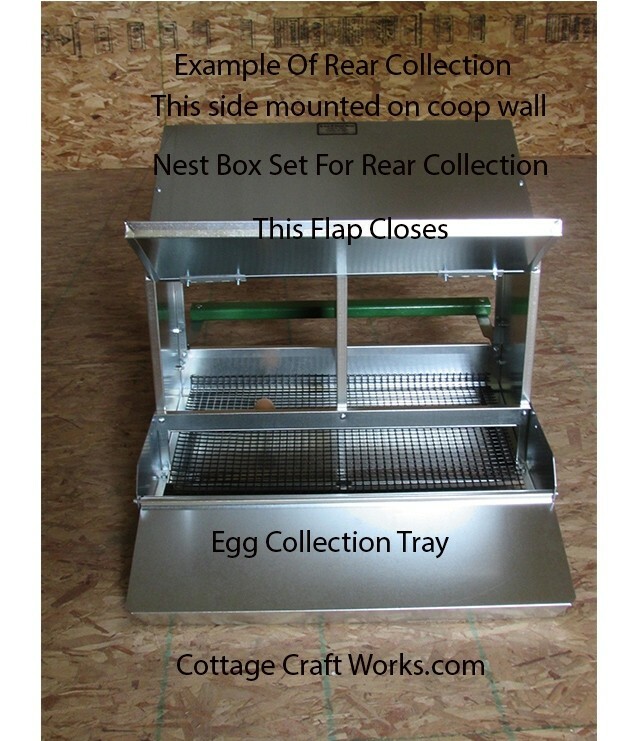 Click Here to see all of our Poultry house products. These boxes take up small spaces yet will accommodate large flocks. 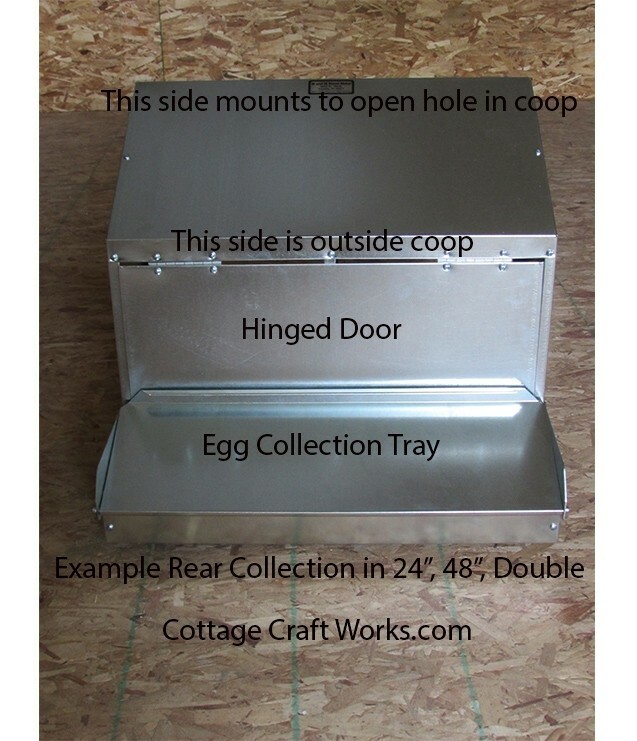 They are available in a front or back collection tray models making them perfect for small coops and chicken tractors. "I received and assembled a roll away nest I ordered from you today. I wanted to tell you that I am extremely pleased with the quality and workmanship of this nest. Everything bolted together perfect and was built out of heavy gauge metal. Very impressive".